Project introduction: This wheat flour mill plant is whole PLC control system can be fully automatic operation. 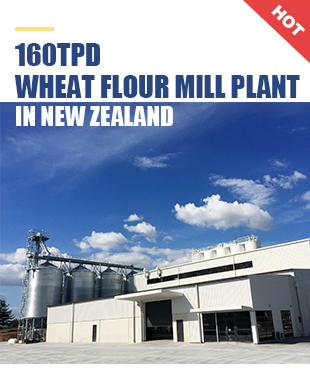 It is build in New Zealand, the capacity is 160 tons per day for wheat processing. It consists of 4 floor steel structure flour mill plant workshop, 250*4 ton silo for wheat storage, 30ton*2 silo for flour, and 25 ton*2 for bran. This is one of our turnkey project, and we sent more than 20 technicians for installation, it takes around 6 month to finish.